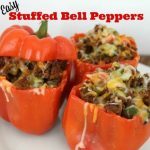 If you’re looking for an easy and palate pleasing Stuffed Bell Pepper Recipe that’s perfect for a weeknight meal, I have the one for you. I grew up eating my mom’s stuffed bell peppers. It’s comfort food, but it’s also healthy. Win-win. When my kids walked in the door last night, the air was filled with the amazing aroma this recipe gives off. I know I’ve made an award-winning (meaning kid pleasing) recipe when they say two things: what’s for dinner it smells amazing and that was really good mom. The hardest part of this recipe (and it’s not hard at all) is getting the bell peppers ready to be stuffed. You just chop off the top and take out the seeded core. After that, the most time consuming part is chopping the veggies. Unless you have a food processor. An item that’s on my kitchen wishlist. Side note: I stated that this recipe feeds 5 because that’s how many are in my family. And, we each only had one stuffed pepper because we had sides with it as well. One stuffed pepper, plus a side like rice and fresh fruit, fills us up.Just note that this recipe is for 5 people to each have one pepper. An easy stuffed bell pepper recipe perfect for a weeknight meal. 2. Chop your 1/4 cup onion and half cup bell peppers for filling. Set aside. 4. While the whole peppers are baking, pour your 3 Tablespoons of olive oil and heat in a skillet over medium heat. When the oil is hot, add the diced onions and peppers and cook for 2 to 3 minutes until soft. Add the minced garlic and cook about 1 minute. Add the spinach and cook for 1 minute. Add the 1 lb of ground beef and break it up with a wooden spoon. Stir it into your vegetable mixture and cook for 2 to 3 minutes. Add the tomato paste, chili powder, cumin, salt and pepper. Cook until the meat is mostly browned, about 10 minutes. 5. 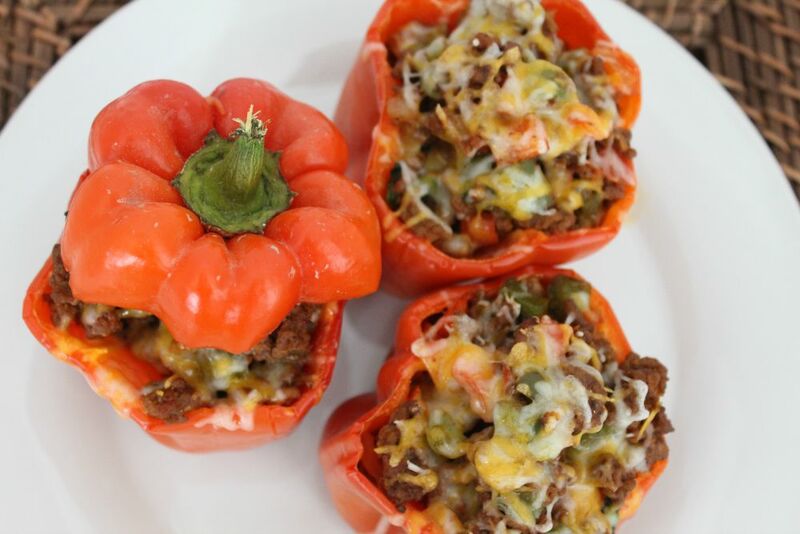 Divide the meat mixture evenly into your prepared whole bell peppers. Return them to the oven for 7 minutes. Add cheese (optional) and cook another 3 minutes. If you don't add cheese, cook them for a whole 10 minutes before removing from oven. The peppers should be wrinkly, the cheese melted and the meat browned on top. You can substitute spinach for kale. You can substitute the diced bell peppers for zucchini or yellow squash. Serve the peppers with rice and some fresh fruit. 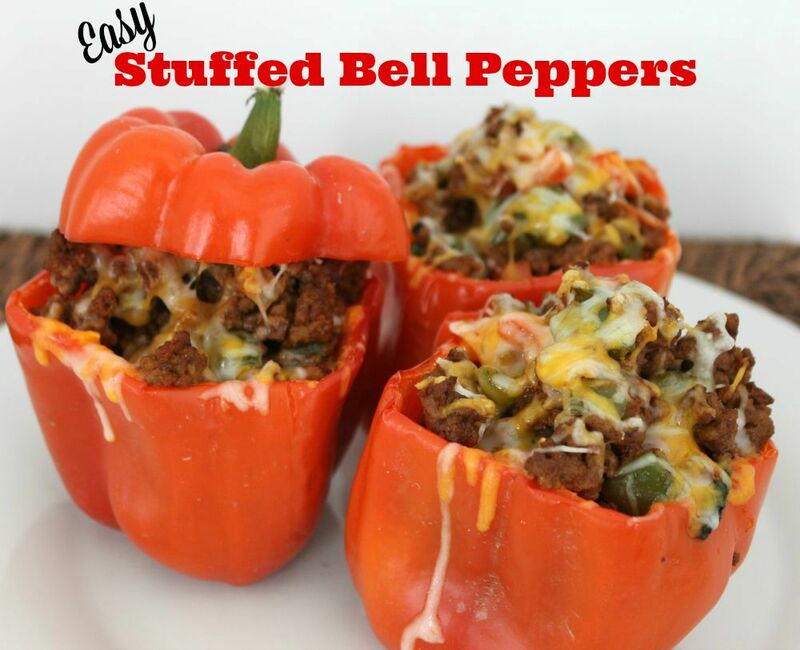 Is this easy stuffed bell pepper recipe something you think your family will enjoy? My 11 year old wasn’t quite sure if he would like it, but as soon as he took a bite he couldn’t believe how good it was. This is a great way to serve your kids a good amount of vegetables. Hi Julie! This recipe looks delicious and filled with nutritional goodies. Yum! Thank you Deana! The flavors were pretty amazing. This was delish!!! the only thing I did differently is halved the cumin and chili pepper cuz I don’t like spicy at all.. But this smelled great cooking.. I loved the spinach in it.. and it tasted Great! I served it with some brown rice and hubby couldn’t stop eating it! Thank you! I am so glad it turned out good for you! My sons are now vegetarians, so I’m going to have to come up with an alternative recipe. I’ve seen it with quinoa before, but that’s not their favorite. Very good. I used green peppers from my garden along with zucchini and onion. I should have cooked them longer though. Hi Velita! Glad the flavors were great! I usually use 80/20 as well and sometimes drain if the grease is too much. I’ll have to try 90/10 also and see how it turns out. Thanks for stopping by!